Royal Philips has introduced new digital solutions and services to advance pathology at the 2017 United States and Canadian Academy of Pathology (USCAP) Annual Meeting. The event is being held from 4 to 10 March in Texas. The company has developed new IntelliSite Collaboration Suite to be used on the firm’s HealthSuite digital platform, which will connect pathologists across the globe. Philips HealthSuite digital platform provides pathologists with access to expertise and consultation services to accelerate turnaround times and reduce costs for consultation. The suite of computational pathology solutions provide quantitative support to the pathologist, in addition to guiding in tissue extraction for molecular diagnostics. 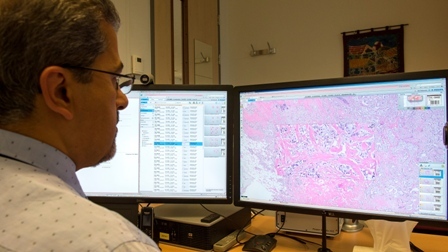 According to Philips, the digital pathology solutions have been expanded to support computational pathology offerings from the company and partners. Philips, along with Visiopharm, will provide applications for semi-quantification of breast IHC markers. TissueMark research application enables to identify tumor region, as well as quantify macro dissection. Another Philips’ research application Xplore will enable image and study data management, as well as biomarker discovery with additional tools that help streamline research and biomarker discovery. Philips IntelliSite pathology solution is designed to add new capabilities to the open research platform, supporting additional image file formats in its image management system, including DICOM. In addition, the firm unveiled new computed tomography (CT) solution, Access CT, which offers enhanced image quality across diverse patient population and wide range of exam types. The new solution helps healthcare organizations to enhance CT imaging capabilities for treating more patients at affordable cost. Image: Philips’ new digital pathology solutions will help to improve patient care. Photo: courtesy of Koninklijke Philips N.V.